As the Big Data explosion continues at an almost incomprehensible rate, being able to understand and process it becomes even more challenging. 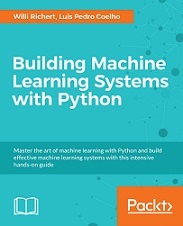 With Building Machine Learning Systems with Python, you'll learn everything you need to tackle the modern data deluge - by harnessing the unique capabilities of Python and its extensive range of numerical and scientific libraries, you will be able to create complex algorithms that can 'learn' from data, allowing you to uncover patterns, make predictions, and gain a more in-depth understanding of your data. Featuring a wealth of real-world examples, this book provides gives you with an accessible route into Python machine learning. Learn the Iris dataset, find out how to build complex classifiers, and get to grips with clustering through practical examples that deliver complex ideas with clarity. Dig deeper into machine learning, and discover guidance on classification and regression, with practical machine learning projects outlining effective strategies for sentiment analysis and basket analysis. The book also takes you through the latest in computer vision, demonstrating how image processing can be used for pattern recognition, as well as showing you how to get a clearer picture of your data and trends by using dimensionality reduction. Willi Richert has a PhD in Machine Learning/Robotics and currently works for Microsoft in the Bing Core Relevance Team. He performs statistical machine translation. Luis Pedro Coelho is a Computational Biologist: someone who uses computers as a tool to understand biological systems. Within this large field, Luis works in Bioimage Informatics, which is the application of machine learning techniques to the analysis of images of biological specimens.